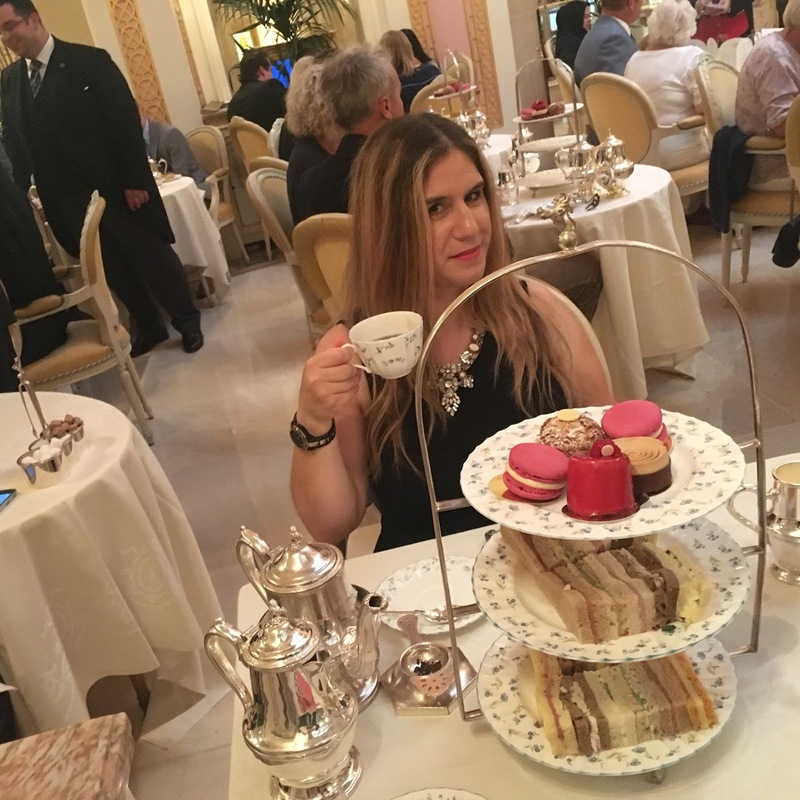 Having Afternoon Tea is one of my favourite things as regular readers of BeautySwot.com well know, so I was absolutely delighted to find that one of my birthday gifts was Afternoon Tea for Two at The Ritz. Being The Ritz, we had to book a couple of months in advance and even then one of the few slots we were able to get was the last sitting on a Monday afternoon. So, in early September, off we went all dressed up, the tall blonde one in his suit and tie, me in a little black dress and patent heels, ready to enjoy the sumptuous treat awaiting us. The first thing to note was the delightful, cheerful and friendly doorman who greeted us on our arrival. It really is the little touches that put a smile on your face. 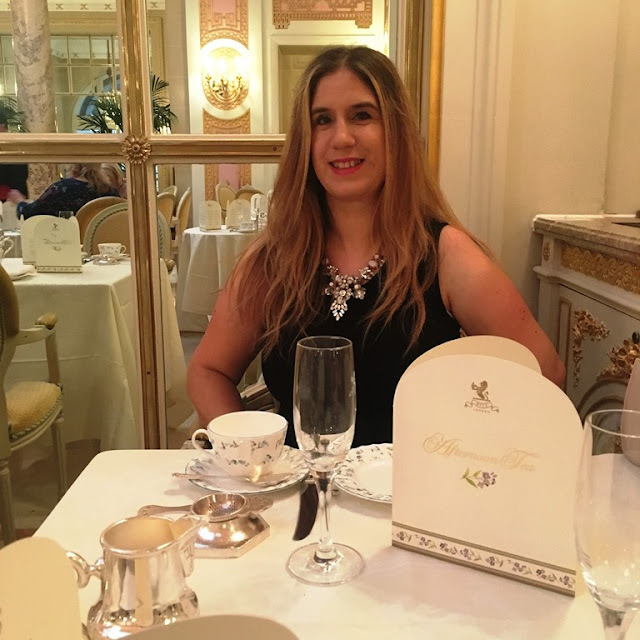 We made our way to the Palm Court where Afternoon Tea is served, and were shown to our table - you can see just how exquisite a setting it is from the photo above. I opted for the 'house' tea - The Ritz Royal English and after the sandwiches I tried The Rose Congou to enjoy with my scones and cakes - both equally delicious and delicate, neither needing milk or sugar to enjoy. We had advised, when booking, that one of the party was dairy free and they brought separate sandwiches for the blonde one and explained the difference. There was nothing surprising about the sandwich fillings on reading the menu, the offering pretty standard, but the colourful array of sandwiches were fresh, generously sized and decidedly moreish so we enjoyed a second serving! The scones were served warm and the blonde one received a separate dairy free batch which he said were most delicious. He was also brought his own separate plate of pastries which he appreciated and endlessly gushed about how tasty it all was... I couldn't disagree, the sweets were bitesize and the perfect balance of sweetness, fruitiness and a satisfying chocolate/coffee hit. I did enjoy the alcohol laced profiterole which was light and fluffy and creamy on the inside ...mmmm! These all really hit the spot. Just when we felt we could eat no more, a waiter came around with a cake trolley offering a slice of cake, well who were we to say no.... I enjoyed the exotic fruit sponge, foregoing the chocolate one and one final time they offered the blonde one a dairy free option. 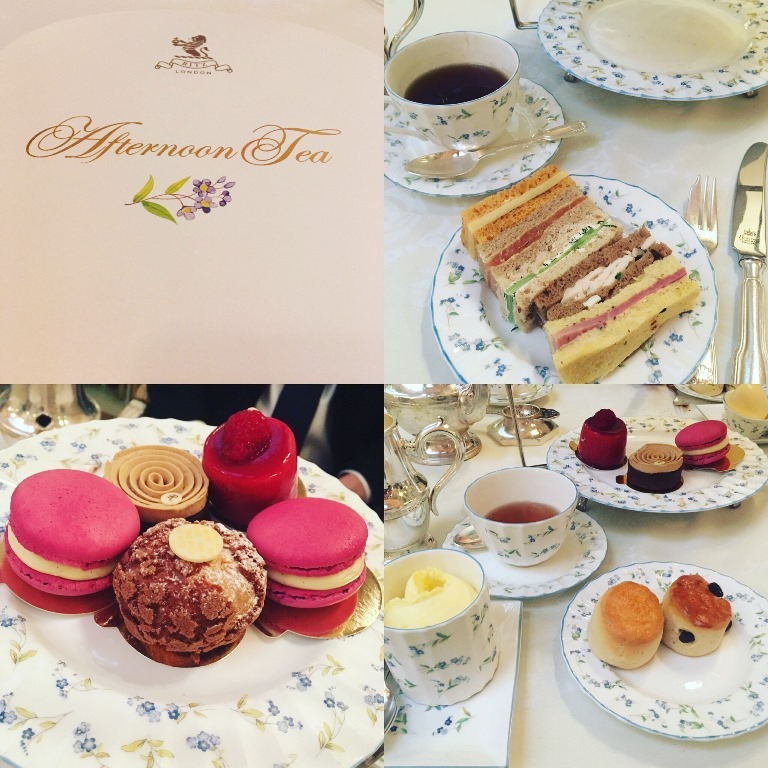 Afternoon Tea is deceptively filling, best enjoyed on an empty stomach. We had two waiters during the afternoon and found the service to be attentive and friendly throughout. 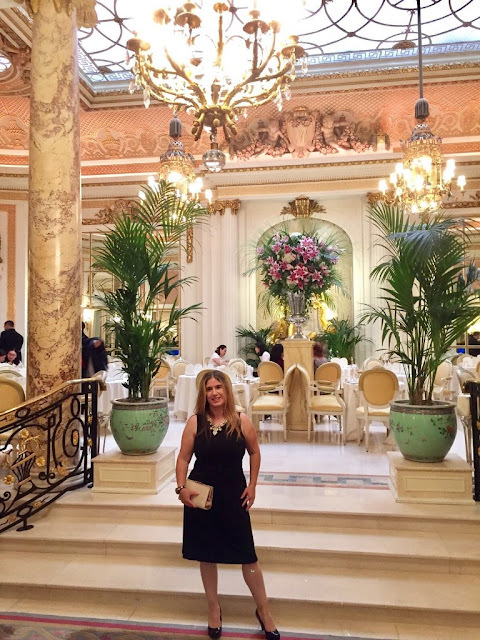 We really enjoyed our afternoon at The Ritz. The Afternoon Tea was exceptional, it was leisurely, relaxing and The Palm Court was wonderfully opulent but not at all stuffy. The guests ranged from young to old, parties of women, couples and families, all appearing to enjoy this very traditional British pastime. 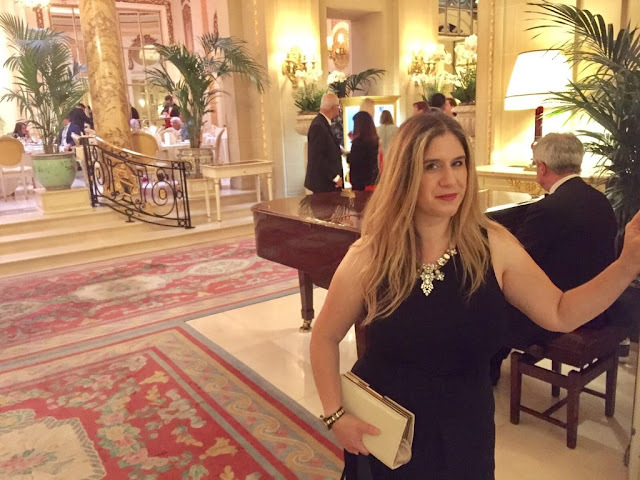 I have heard that some guests feel rushed at The Ritz ( bookings are allocated 90 minutes, which I feel is ample time) but this could be at busier and more popular times of the year and times in the afternoon. We certainly didn't feel rushed and the last setting of the day was a good choice as it served as dinner for us. Before leaving we were given a book about Afternoon Tea and I couldn't resist having my photo taken with the pianist who had been playing live music throughout. Without A Hitch - Available Now!